Researchers at the University of Georgia have created a new therapeutic for prostate cancer that has shown great efficacy in mouse models of the disease. They published their findings recently in the journal Nanomedicine: Nanotechnology, Biology and Medicine. The treatment is designed to inhibit the activity of a protein called PAK-1, which contributes to the development of highly invasive prostate cancer cells. Aside from non-melanoma skin cancer, prostate cancer is the most common cancer among men in the U.S., according to the Centers for Disease Control and Prevention. It is also one of the leading causes of cancer death among men of all races. "PAK-1 is kind of like an on/off switch," said study co-author Somanath Shenoy, an associate professor in UGA's College of Pharmacy. "When it turns on, it makes cancerous cells turn into metastatic cells that spread throughout the body." With the help of Brian Cummings, an associate professor in UGA's College of Pharmacy, the researchers developed a way to package and administer a small molecule called IPA-3, which limits the activity of PAK-1 proteins. They enveloped the IPA-3 molecule in a bubble-like structure called a liposome and injected it intravenously. The liposome shell surrounding IPA-3 ensures that it is not metabolized by the body too quickly, allowing the inhibitor enough time to disrupt the PAK-1 protein. 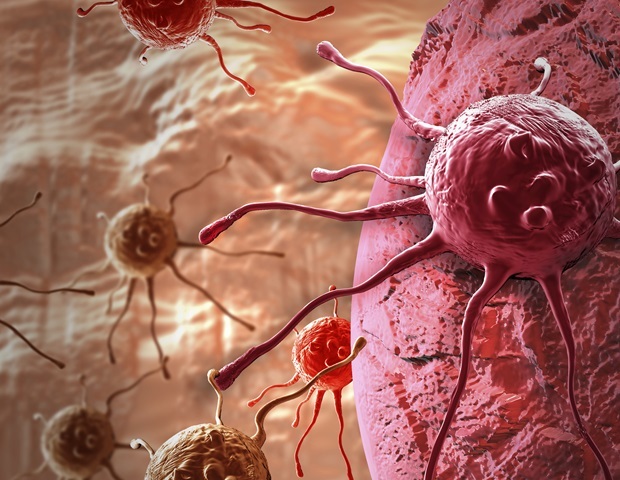 The researchers found that this molecule significantly slowed the progression of cancer in mice, and it also forced the cancerous cells to undergo apoptosis—a kind of programmed cell death. "When we first began these experiments, we injected IPA-3 directly into the bloodstream, but it was absorbed so quickly that we had to administer the treatment seven days a week for it to be effective," Shenoy said. "But the liposome that Dr. Cummings created makes the IPA-3 much more stable, and it reduced the treatment regimen to only twice a week." The preliminary results suggest that IPA-3 might be a viable treatment for prostate cancer in humans, but Shenoy cautions that much work must be done before human clinical trials can begin. "The results of our experiments are promising, and we hope to move toward clinical trials soon," he said, "but we must figure out what side effects this treatment may have before we can think about using it in humans."